Las Vegas Boulevard is the expansion to Rudiger Dorn’s Las Vegas dice game. If you enjoyed Las Vegas but wish it had some more meat, then this is the box of goodies for you. I certainly fall into this category, and have been waiting eagerly for this expansion since it was first announced as Las Vegas Lights (cool name! ), then renamed to Las Vegas Plus (boooring! ), and finally ended up as Las Vegas Boulevard (meh!). They also pulled one last switcheroo, replacing the pretty woman on the cover as seen in the current representative image with a skeevy-looking Johnny Depp wannabe. I have been really surprised by how much fun we’ve had with the Las Vegas base game. 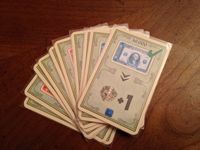 It’s been a hit with the causal gamers at work, as well as with my family, which includes two young gamer kids and my wife, who loves heavy Euros and wargames. It just has a great mix of luck, push-your-luck, competition, and strategy. The simplicity of the game is one of its big draws, but I have always favored playing with the “white dice” variant in the base game rulebook, just to add a few more tactical options. Las Vegas Boulevard adds 12(!) different modules that each add to the game. They are independent, so you can mix in more layers of complexity and/or wackiness as you please. From what I’ve read here on the ‘Geek, it may be some time before this expansion is distributed in the USA. I was fortunate enough to take a recent business trip to Germany, and sought out a game store in Cologne. I found a very nice little store called Spielbrett that not only had Las Vegas Boulevard, but also a nice used game section where I scored great-condition copies of San Marco and Millionenspiel (which is another awesome dice game, by the way). I thought I’d post this review so that everyone can see the goodness that lies in store. 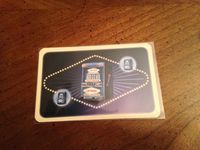 OK, so this just a single card that gives different amounts to stop adding cash to casinos depending on the number of players. This helps the game scale better across the player range of 2-8 players. This is a good idea, and I see no reason not to always use it. These are self explanatory. Just mix them in, and go for even bigger payouts! I just wish they had been a more distinctive color. These are also self explanatory. These new dice allow you to play with up to 8 players. Note that the components won’t let you use all the expansions with 8 players, but it would probably be a good idea to keep the game simple at that player count anyway. (I forgot to take a picture of this one. Concentrate REALLY HARD and try to envision 2 white dice. There you go). I’ll admit these modules haven’t exactly been Earth-shattering so far. 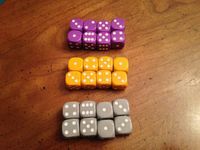 These are just two white dice to allow you to use the popular “White Dice” variant from the base game with up to 5 people. Yay! Now things start to get interesting. These are single large dice in all the player colors except purple (because, see Module #6 below). These dice replace one of your normal dice, and count as 2 dice in whatever casino you place them. This is a wonderfully simple way to add a new tactical option. The big dice have black pips instead of white (except for the black die, of course). I actually really wish these had gold pips, which would have been appropriately AWESOME. Maybe I’ll get daring with a metallic Sharpie. The rulebook calls these “violet,” but we all know they are purple. With this variant, each player replaces 1-2 of their color dice with purple “Kicker” dice. These are placed just like normal colored dice. 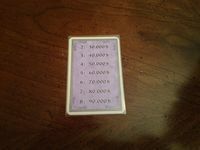 However, each purple die kicks a die out the casino it goes to. The kicked die goes back to the player who owns it, and the purple die goes out of the round. I love this because it makes the playfield much more dynamic. It also adds a little time to the game though, so be prepared for that. The rulebook is silent on how to combine this with the “White Dice” variant from the base game, but I’ve had no problem using them together. We just play that white dice get kicked out of the round. I suppose you could also rule that white dice can’t be kicked. These are 6 Rainbow Cards that are mixed in with the money deck. When distributing cash to the casinos, they count at $40,000. 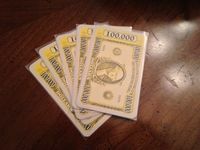 However, just before casinos cash out, they are replaced by a card from the top of the money deck. These are very much in keeping with the Las Vegas theme, and are super fun. People will go out of their way to try to win a Rainbow Card just to see what they get. I use these every time. This provides a 7th Casino where you can place a group of like-numbered dice as long as that number has not already been placed there. So I might place 2 threes, then you beat that with 3 fours, etc. The rulebook recommends using the Slot Machine only at higher player counts, and I can see that, as it diminishes competition for the rest of the casinos. This module is a slightly complex to explain, especially the special rules for resolving ties. It is also a bit of a bummer that it comes on a card rather than a cardboard piece. This one is OK, but it is not my favorite, and it seems to be the least confluent with the rest of the game. These are a neat idea, although the implementation is a bit clunky. 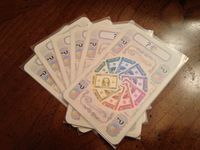 Each player is dealt 1 or 2 of these cards, which are kept secret and show a particular denomination of money. If a player manages to get a bill of that color, they get a $50,000 bonus, which they keep track of with a black “notify” die. This die starts at 1, so everyone gets $50,000 even if they never achieve a bonus card. I think it would be easier to just write it down or use pennies (or poker chips!) to track this. I do like the Bonus Card variant because it gives everyone a secret goal and it seems cleverly balanced. Of course you’ll pursue the bonus for a $90,000 bill, but you’ll face stiff competition. However, you may be able to sneak in easily to grab that $10,000 $30,000 bill you need. These change the dynamic a bit, but I like them and use them sometimes. 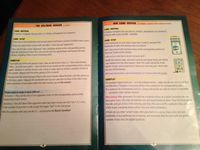 These cards are just little walls of multilanguage text that are dealt out to the players to give them various wacky one-shot powers, like rerolling dice or adding money to casinos. I don’t like these. They seem to be interjecting chaos and complexity just for the sake of it. Plus, they have all kinds of weird interactions with some of the other game elements that you need to adjudicate. I’m leaving these in the box, but I can see how other groups might like having these secret powers in play. We are going to wrap up on a high note. I am lumping these two together because they are similar. This is an alternate universe Las Vegas game if it was designed by Reiner Knizia and Leo Colvini. This version is much thinkier. Each turn, you roll one of each color die, then place according to the normal rules. You are trying to work things out so that your color(s) score more than any others. The multiplayer version has a nice twist in that the colors you will score for are secret. This is a fairly different game, but one that I really enjoy. It’s a great way to play 2 player, but it works well up to 4 as advertised. So overall, Las Vegas Boulevard is a great package, and I’d highly recommend it to anyone who wants to “gamer-up” their copy of Las Vegas. I have seen reports that Games Surplus can help you get it here in the states, so I would say either jump on that, or on a plane to Germany. This is a great overview of the modules -- thanks for doing this! I'm looking forward to getting my copy at the end of the month. We effectively house-ruled module #1 and #2. Adding players to the base game isn't that tough if you can find five dice of another color, but in the US getting the 14mm dice this game uses is harder. #7 sounds like a lot of fun. Nice review! I love this expansion. I probably paid too much but it was totally worth it. Note, though, the bonus cards range from 30,000 to 70,000. Thanks for the great overview! I got the expansion just a few days ago and haven't had a chance to play with it yet, but I've read the rules and my impressions almost exactly match yours. I'd like to add some quick comments of my own. Las Vegas is my ultimate "social non-party game". Above all, I value it's simplicity. So if I were to rank modules, fun would be the top criteria of course, but simplicity would come second. 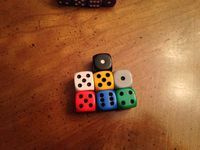 - Big dice are cool, I would throw them in especially when playing with kids, but I don't think they really add anything game wise. So they basically behave like 2 dice that always roll to the same number. I don't see how that would affect strategy. 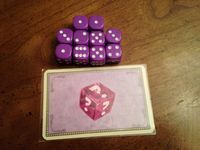 - I only wish they used grey dice for this module as they originally intended, and left purple as just a player color with it's own big die. - Probably my favorite of the small modules due to it's simplicity and fun factor. - Need to try it, but so far sounds too complex, especially for a big crowd. - I agree that the idea sounds nice but the rules are clunky. I had exact same idea about using poker chips! In fact, I'm thinking about adding some chips that actually say "50" on them. That way the chips will not act simply as "counters", but as actual payouts. 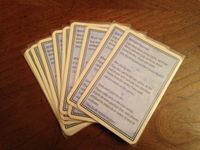 - This could have been ok because these cards don't really add any new rules, except for what the cards themselves say. Problem is, in many cases the text is not clear and requires referring to the rulebook, which itself is not always clear. That's the only module I was able to play so far and I liked it very much! This is a really nice surprise. I don't care if the rules are more complex because this is basically a different game, and I love the ideas here! I think the big dice are most interesting when used with the Kickers! You lose two influence if a kicker boots your big die, so people will hold back on using them as long they can resist. Great overview, thanks a lot! After reading some reviews and threads about it, I guess this expansion is not what I expected. In fact, the only things I care about are the big dice (nice, but not really necessary) and the additional player dice (which I likely won't use). Both are nice additions. The rest is ... well, useless complication. What's the point of adding random draws of cards? Did we really needed those five 100,000 bills? Secret goals for players? Special Abilities? Hmrpf. Module #1 could have simply been a rule update, not a "module" ... come on! And how cheap is the One Armed Bandit? Couldn't they afford cardboard to match it with the casinos? Meh! I would have expected better from Alea, really. This sounds like the argument I have with myself when I want to buy something and I am trying to convince myself not to. you might be right here ... although, I'll buy it anyway. Still, I'm disappointed as I would have hoped for more. When you first open the box you think you wasted your money because what is inside is...sparse. But for me (and it may not be the same for you, I know that), once I added several of the modules, it added enough spice to the game that I want to play it again. An expansion really can't do much more than that. Thanks for the review! I can't wait to pick this one up. Hey, when Drasher25 was in that saintly gaming emporium in Germany, he also had the perspicacity to pick up a 2nd copy, which he auctioned away, and which I was lucky or sage or reckless enough to win. Finally got around to playing it, never played Las Vegas before, and the crowd loved it all. Since it was our first time, we used the varying start, 100ks, and big dice, want to use the rainbow bills and slot machine next. Then the white and purple dice and you have at least three sessions of expanding fun. So now I have a chance to thank Drasher25 publicly for pulling that extra copy, and urge him to do the same on future trips! Thank you for this nice overview, it was really useful.